In the presence of Le Corbusier’s Capitol Complex—including the High Court, the Palace of Assembly, and the Tower of Shadows—I am overwhelmed by the sense of dignity and humanity formed out of brutalist concrete. The elegant layout of the city, begun by Albert Mayer, and the powerful shapes of its buildings, including those by Pierre Jeanneret and many other architects, is a rare study in perfection. After sixty years of northern Indian weather and daily use, the buildings still glow with purpose. Here, I find the simplicity and deep functional beauty shared by fellow modernists such as the Bauhaus masters, Ellsworth Kelly, Frank Stella, and Mark Rothko. This beauty extends from the buildings themselves to the custom furniture, much of it designed by Pierre Jeanneret. These photographs are a series of semi-abstractions—in a sense, portraits of architectures—capturing the essence of the construction in details rather than showing the buildings entire. This is the poetry of space, illuminating the wabi-sabi of imperfection and humility, showing how the concrete has taken on the patina of time. This is a project about what it means to be human and to live in a world where things age and change. I chose an accordion-type format for the book to capture the monumental scale of these structures and to give a sense of the continuity of the city.. 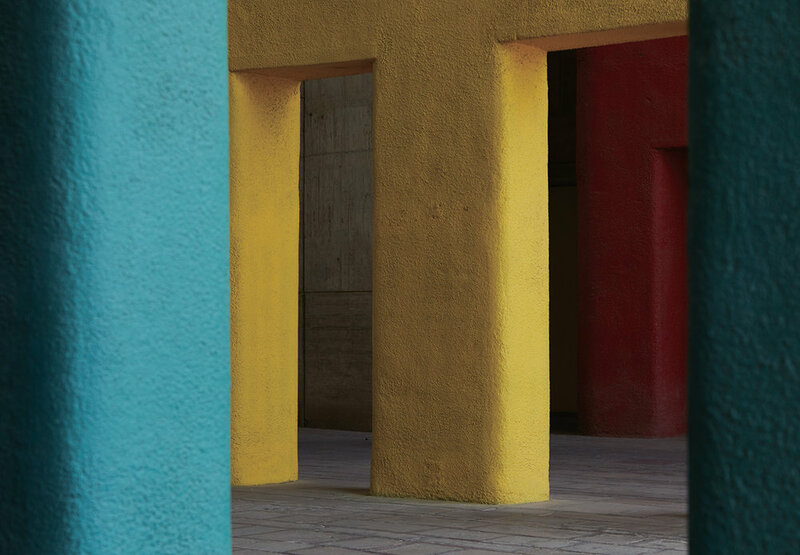 The modernist architect Le Corbusier’s Capitol Complex at Chandigarh, India, remains one of the major touchstones of 20th-century architecture. Commissioned by the government of India after gaining independence, the complex of brutalist concrete structures has become a pilgrimage site for architecture lovers and scholars for the past six decades. These structures have been photographed many times, but the Japanese photographer Yoshihiro Makino takes a different approach. Instead of documenting the buildings in typical fashion, the photographs become meditations on the intentions of the project, and of Le Corbusier’s architectural philosophy. Composed of two accordion-folded books in a cloth slipcase, Makino and revered art director Tamotu Yagi create a double-sided visual experience revealing on the front side of the accordion books an explosion of saturated color exteriors and interiors, then on the backsides details and rarely seen rooms in lush black & white. The combination is both refreshing and mesmerizing. Taking its name from Le Corbusier’s monument for the city—The Open Hand, which symbolizes a new cooperation of the newly formed government—this publication is a visual metaphor for the unfolding experience of the Chandigarh. Yoshihiro Makino, originally from Tokyo, is a photographer based in Los Angeles. He has photographed for many publications, including Architectural Digest, Casa Brutus, and Elle Décor Japan. The Open Hand is published in a limited edition of 800 copies.